Watching the Oscars is one of the most social TV-watching events to take place all year. Whether you’re texting friends and family your hopes for Oscar winners or watching your Facebook status stream for witty (perhaps catty?) status statements, or even tweeting along with the masses, many of us want to share our Oscar viewing experience with others. Enter the official Oscars app for 2013, which gives you everything from information on nominees, movie trailers of the nominated films, and exclusive videos and photos so you can have that info at your fingertips as you watch the stars walk the red carpet. No having to Google the actor/actress to remember the name of the movie or co-star you can no longer remember. Perhaps the most exciting and competitive aspect of the app is that it allows you to cast your own votes on a virtual ballot and compare it with your friends’ choices. What’s a little Oscar competition among friends? During the Oscars, you can use the app as a second screen to watch celebs walk the Red Carpet from a different angle and get a backstage pass to see the winners live moments after they’ve won backstage at the Dolby Theater. You can even customize the camera views you want to see. 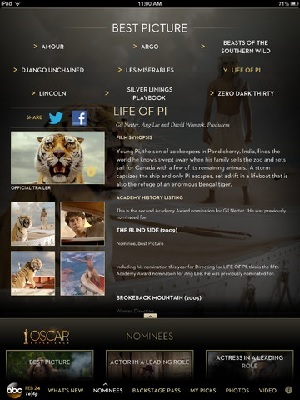 The Oscar app is available for free in the iTunes AppStore, on Google Play and the Amazon Appstore. If you’re solely interested in the fashion glitz and glam or Hollywood gossip, download the E! Entertainment app, E! Live From the Red Carpet. You’ll have another source to feed that craving for Red Carpet access, including celeb news and hi-res photos that you can zoom in to check out the latest in fashion, up close and personal. The E! Live From the Red Carpet app is free in the iTunes AppStore, on Google Play and for Windows Phone.